Extreame Savings Item! Free Shipping Included! 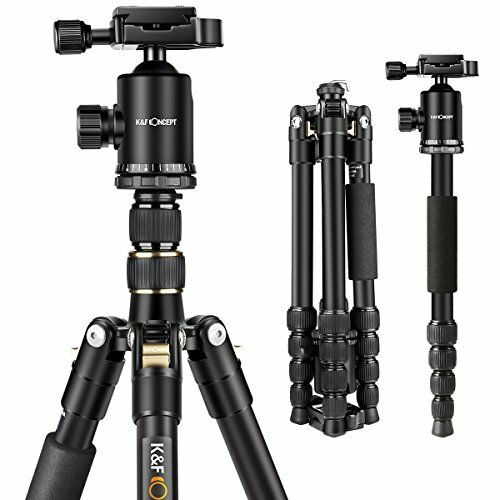 Save 43% on the K&F Concept 60'' Ultra Compact and Lightweight Aluminum Travel Tripod with Monpod,360° Panorama Ball Head for Canon Nikon Sony DSLR Camera by K&F Concept at EISF. MPN: KF09.008. Hurry! Limited time offer. Offer valid only while supplies last. 【Compact & Portable】 Quality military magnesium aluminum alloy,corrosion resistance; Tripod with ball head weighs only 3.33 lbs, can be 180°reflexed and folded to 14.76'', easy to carry when travel. 【EASY SET UP】 5 sections tube leg and the max diameter is 25mm; Spiral type locking knob allows you to adjust the working height from 14.76'' to 60'' in seconds; The height without column reaches 47'',very stable and the height with center column is 60'',making standing shooting easier. 【360° PANORAMA】The metal ball head can be rotated 360 degrees, helping to expand dslr camera activity range when panoramic shooting. (the bubble level help to judge the level and the accurate composition). 【Detachable Monopod】 It can be turned into a lightweight monopod or walking stick alone to make your photography more diverse. 【Multiangle Shooting】 Lowest angle shooting, macro shooting, and special photography can be achieved through inverted central axis. Note: For camera with telephoto zoom lens, you need to buy a tripod mount ring additionally or telephoto lens bracket for better balance. If you have any questions about this product by K&F Concept, contact us by completing and submitting the form below. If you are looking for a specif part number, please include it with your message.